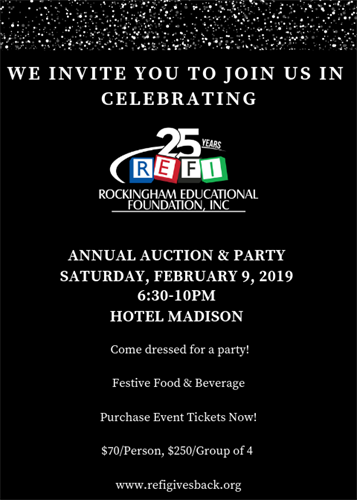 The Rockingham Educational Foundation Inc. (REFI) is proud to support the students and teachers of Rockingham County Public Schools! We invite you to celebrate 25 years of giving during our Annual Auction and Party! Enjoy festive food and drink and have fun bidding at our silent and live auction. All proceeds go to support our Educational Grants and Teacher Supply Depot!